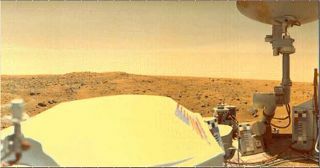 A Viking 1 Lander image of Mars' Chryse Planitia. The large white object at lower left and center, with the American flag on the side, is the spacecraft's radiothermal generator (RTG) cover. The shot is looking to the northwest of the lander. Martian soil analyzed 30 years ago by NASA's Viking landers might contain life, according to a controversial new study that one scientist called "bogus." The dry, freezing Martian surface could be home to microbes whose cells are filled with a mixture of hydrogen peroxide and water, said Joop Houtkooper of the University of Giessen, Germany. But other scientists are skeptical of his results, which is the latest in a long series of contentious claims about what the Viking landers might or could have found. Houtkooper reanalyzed data from the Gas Exchange (GEx) experiment carried out by the robotic landers in the 1970s and speculates the martian soil contained detectable amounts of life. "It comes out to a little more than one part per thousand by weight, comparable to what is found in some permafrost in Antarctica," Houtkooper said. Norman Pace, a microbiologist at the University of Colorado, is skeptical of the new claims. "It sounds bogus to me," Pace told SPACE.com. "I don't consider the chemical results to be particularly credible in light of the harsh conditions that Mars offers." The findings were presented by Houtkooper at the European Planetary Science Congress in Potsdam, Germany this week and are detailed in a recent issue of the International Journal of Astrobiology. The GEx experiment detected rises in oxygen and carbon dioxide gas in soil samples collected on the martian surface. "If we assume these gases were produced during the breakdown of organic material together with hydrogen peroxide solution, we can calculate the masses needed to produce the volume of gas measured," Houtkooper explained. Houtkooper and his colleague Dirk Schulze-Makuch from Washington State University speculate that an organism based on hydrogen peroxide and water could survive the harsh martian climate, in which temperatures rarely rise above freezing and can reach -238 degrees Fahrenheit (-150 degrees Celsius) at the poles. The hydrogen peroxide would act like antifreeze for the cell, preventing its insides from crystallizing due to the cold. Hydrogen peroxide-water solutions also tend to attract water, so the alien organisms could scavenge water molecules from the Martian atmosphere, the thinking goes. However, if such creatures were exposed to too much water or atmospheres with high humidity, they could theoretically die through over-hydration. The researchers think this could account for the anomalous GEx results. The experiment exposed samples to water vapor which might have killed any hydrogen peroxide-water microbes died. The resulting breakdown of their cells would release oxygen and their organic compounds would react with the hydrogen peroxide to release carbon dioxide, water vapor and traces of nitrogen. Houtkooper thinks the microbes could be detected by NASA's Phoenix lander, which launched on Aug. 4 and will arrive at Mars next May. While rare, terrestrial organisms are known to use hydrogen-peroxide. The bombardier beetle, Brachinus Crepitans, uses a 25 percent solution of hydrogen peroxide to shoot steam into the face of pursuing predators. No one suspects there are any beetles on Mars. But most experts have yet to rule out the possibility of microbial life. "There does not appear to be any basic reason why hydrogen peroxide could not be used by living systems," Houtkooper said. "While organisms on Earth have found it advantageous to include salt in their intracellular fluids, hydrogen peroxide may have been more suitable for organisms adapting to the cold, dry environment of Mars." But Pace, the University of Colorado microbiologist, thinks there is one very important reason why hydrogen peroxide life is unlikely. "Hydrogen peroxide inside cells is deadly in terrestrial kinds of cells," Pace said. "In fact, that's one way that our cells combat bacteria, by producing hydrogen peroxide locally." For Pace and many other scientists, the definitive experiment performed by the Viking landers was the gas chromatography mass spectrometry (GC-MS) test, which was capable of identifying substances by their chemical makeup. That test failed to turn up evidence of organic compounds. "That's the interesting experiment. Everything else can be explained chemically," Pace said. Some scientists have speculated the oxygen results from the GEx test came from peroxide-containing iron in the martian soil.